Our sponsor GotGame have released their review on the Y-2842 gaming chair. You can see the review below. Comfort is as important as any high-end GPU in gaming. Regardless if you’re playing a PC or a console, you want to make sure you’re getting the best chair possible… unless you’re a couch kind of guy. PC components become useless faster than you’d think, but a good chair can protect your back for a lifetime. Changing a CPU will seem rather easy compared to the effort of alleviating a severe back pain. So, how much budget do you allocate for a new chair when you decide it’s start to get serious with gaming? Not much, I bet. Sure thing, gaming chairs are kind of expensive and inaccessible for most, but they don’t have to be. A top of the line graphics card will run you around $400 / £400, so why not save up an extra £80 and get a good and comfortable chair? There are a lot of viable options on the market, based on where you live and how much you want to spend. But today I will be briefly talking about a rather interesting model I’ve been sitting on for the past few weeks, it’s Earth Croc’s Y-2824, an orange striped office and racing gaming chair. Sounds silly, right? Getting a ‘gaming’ chair. How is it different from a regular chair in order to deserve a higher price tag? Well, on top of the awesome design, which sets them apart from regular boring office chairs, it’s the fact that they’re built with the average/ pro gamer’s comfort in mind. Having a nine to five job can really have a negative impact on your back, and if you’re a gamer, as myself, you’ll likely spend the rest of the day back at home on another chair. The Y-2824 is advertised to be comfortable even after a 15 hours long gaming session, and despite the fact that I couldn’t test it myself for a period longer than 8 hours, I’m pretty confident it would keep you nice and comfy for even more. The chair’s construction is very solid, having its base made by steel, and can hold up to 180KG. It also features a very interesting shape, similar to the chairs found in racing cars, which perfectly fits your back, while also preventing unwanted sweat by having two holes placed near the shoulder area. The quality is similar between offered models, so if you don’t like the orange chair I picked, you can always choose another model which has a design more closer to want you want (or that goes well with your gaming setup). Even if you’re not a gamer, the all-black model will be a blast in your home office. I’ve made myself quite a bad reputation between chairs, they fear me and I fear them. I’ve made several victims throughout the years, leaving chairs armless and with serious tears in the fabric. It’s not like I do it on purpose, but by far my favourite way of using a chair is with my feet up on the desk and with my body in a very comfortable lying position. So, naturally, I value durability most. This fortunately might be Y-2824’s strongest point. For the first time I purposely tried pushing a chair to its limits, and I wasn’t even able to hear a squeak. What I would have certainly loved to have, was a head supporting pillow, which can be a God sent for those who spend a lot of time at their desk. But, overall, the Y-2824 is a very comfortable chair, with a stunning design and at a very competitive price. Should you buy one? Definitely. However, if you do have a bit more money saved up and want even more comfort and an array of new features, such as adjustable arm rest, two pillows, and more, I strongly recommend picking up one the higher end models EarthCroc has in store. If you want to grab one, head over to EarthCroc’s official website, you won’t regret it! 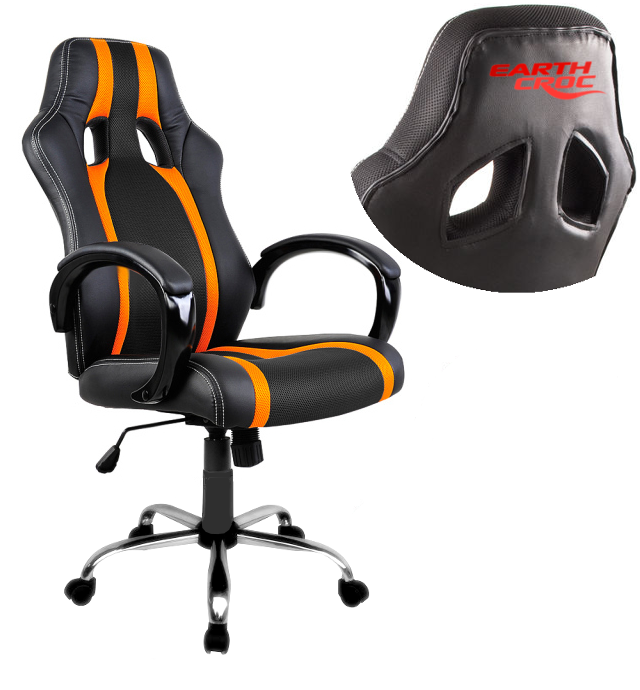 This entry was posted in Category 1 and tagged EarthCroc, EarthCroc | Orange Striped Office Racing Gaming Chair Y-2842, gaming chair, office chair, Racing Gaming Chair, Y-2842 on 25/10/2015 by EarthCroc Ltd..